Whether to clean your air ducts or not has always been a dilemma. There are two types of people – the first ones who do not think there’s any need of duct cleaning while there are others who need the air ducts cleaned regularly for the health and safety of their family, children and pets. 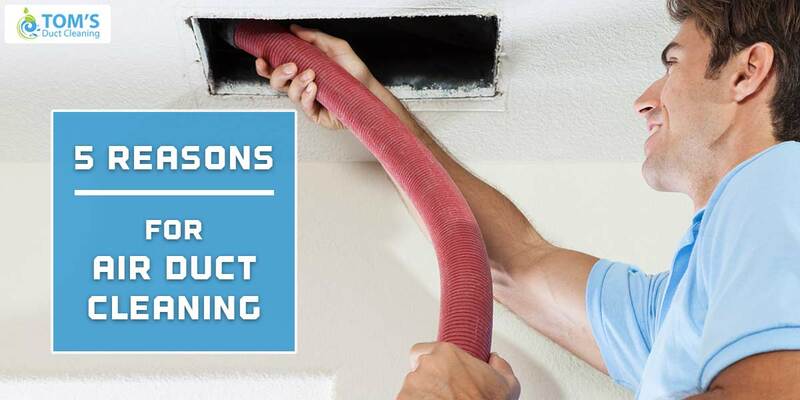 If you fall in the former category, here are five reasons why you should consider air duct cleaning on a regular basis. The most important reason to clean your air ducts is to keep your air ducts at a distance from the dust, dirt, bacteria and fungus. We take care of our kids to wash their hands when they are done with playing with the pets because their fur contains bacteria and germs that cause diseases if not cleaned properly. Sometimes, the animal fur can get into the vents. This can bring more bacteria, germs and fungus into the air ducts. These are harmful for your toddlers as well as your pets. Many of you have your air duct system in the basement. And, if you have recently moved to a new house, it is likely to have mould in your old air ducts. Also, there are times that you haven’t remembered when you’ve had cleaned the air ducts of your flooded basement or whether older residents of your home has seen the basement flooded in the past. So, it is always important to clean your air ducts for any moulds from the past or present. Moulds can jam pack your air vents and can damage your HVAC systems. This can increase your expenses of buying a complete new HVAC unit or may be HVAC repair costs to keep your air conditioners in the working condition. Now that you know that cleaning your air ducts are important to remove everything from dust, dirt, germs to moulds. But, why would you remove all these dirty stuff from your air ducts? Dust, dirt, germs, fungus and bacteria in your residential air ducts bring allergens in your home. Kids under 4 years of age are likely to get infected from these allergies and might catch diseases like bronchitis and other respiratory allergies that may even lead to asthma. In addition to breathing difficulties, some may even create skin allergies. That’s why it’s highly recommended regularly clean your air ducts from time to time. Dirty ducts do not allow the system to work appropriately. In fact the wind from the air ducts come along with the debris present in the air ducts. These debris reduce the air quality in your home to very poor instead of fresh. When you have your air ducts cleaned, you have removed everything from dust, dirt, moulds, fungus to any other bacteria. This drastically improves the quality of your indoor air and makes it fresh making it healthy for your family members. Cleaning your air ducts is important because when you don’t remove dust and moulds from your air ducts, it can decrease the efficiency of the HVAC unit. When it decreases its efficiency, it will work inappropriately and might get damaged due to trafficked dust in the ducts. This results in to increased expenses of buying a new unit or its repairs.